I saw this blown glass sculpture hanging from a ceiling in a shop in Chinatown. It looked like a Chihuly but I don't know for sure. It was so beautiful, I had to get a photo. I agree it was beautiful. Very beautiful design with colors. For a moment I thought it was worms. Very colorful! The colors are vivid! Love it! 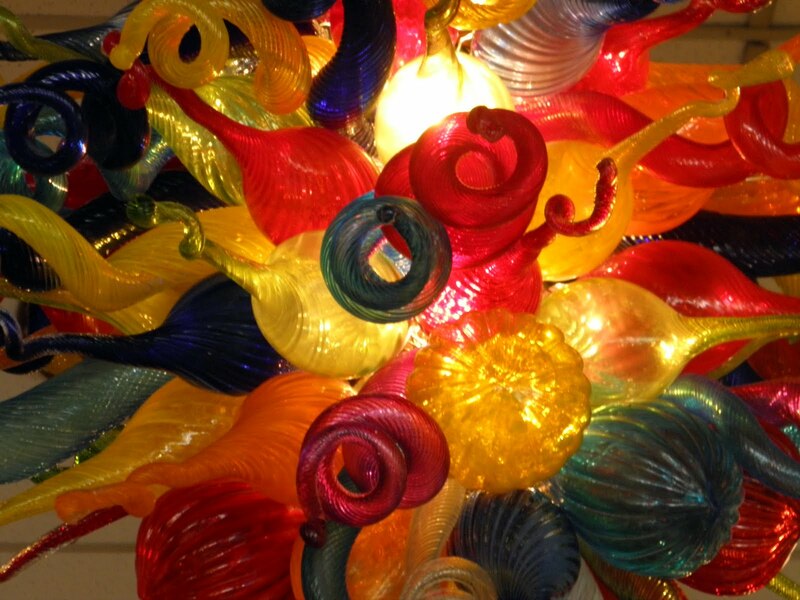 I had to google search to see what a Chihuly is. It looks that those bulging eye goldfish. Very colorful. A lovely work of art in curlicues and swirls. It is beautifully colorful. I'm glad you looked up! I love things like that. So creative and interesting. So gorgeous, and fantastic rainbow colors, Jo! Ther was a Chihuly exhibition at Kew Gardens in London that I went to a few years ago. There were both indoor and outdoor exhibits. It was my introduction to his work and I found it mind blowing. This beautiful sculpture certainly looks like one of his. A big thanks to all who stopped by and commented. it's very pretty. I've always been fascinated by the glass blowing demonstrations. It's amazing how they can take a blob of glass and turn it into something spectacular. That's why I prefer glass over diamonds, as latter are able to behave alike. Please have a good Tuesday. I love taking photos in Chinatown. You can always count on getting something colorful and different. What a unqie looking glass sculpture!! those blown glass masterpiece is awesome. is it a chandelier? So very cool how all the colors are next to each other. Fabulous photography my dear.